Our Indian tribal tour today will discuss undoubtedly the most famous tribes of India. These Khasi tribes have a unique culture which any one would find strange but enjoy to the fullest. 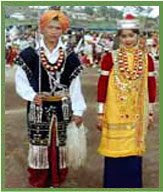 Historically Khasi tribes of India are regarded as the earliest migrants from Myanmar. These Indian tribes also ran a kingdom but it was later diluted and liquidized by the Britishers and controlled over. Assam, Khasi Jaintia hills in Meghalaya, Punjab, Uttar Pradesh, Manipur, Jammu and Kashmir and West Bengal are some of the the major places inhabited by Khasi tribes of India. The culture followed by these tribes of India is the typical Indian tribal culture, but is distinctive in its own way. It is probably the only Indian tribes where females are given priority over the males. The property is passed from the mother to the youngest daughter. Dance and music are the integral part of the life of these popular tribes of India. Drums, Guitars and flutes are some of the instruments mastered by Khasi tribe. The marriage culture is very unique as the groom has to live in the bride's home after marriage. These Indian tribes speak Khasi which is an Austro – Asiatic language. Men amongst Khasi tribes of India wear long sleeveless without collar coat known as Jymphong. They also wear headgears or turbans. Women of the Khasi tribes are very fond of wearing jewelery and earrings. Both the genders of these tribes of India wear silver chains at their waists. The major part of Khasi tribes of India follow Christianity. For these Indian tribes God U Blei Nong-thaw is the supreme creator and goddess who protect them from all the troubles of life. Ulei Longspah (god of wealth), Shnong (tutelary deity of the village) and many other gods are also worshiped. Rice is the staple food of the Khasis tribes of India. They also cosume fish and meat and occasionally drink rice beer. 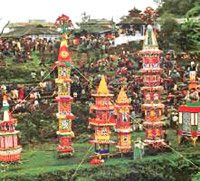 Nongkrem is the chief festival celebrated amongst the Khasi tribes. This is a five days long religious festival that falls in the month of November. The atmosphere is also very festive in the month of April. Shad Suk Mynsiem is celebrated for three days by these enthusiastic tribes of India. Labels: famous tribes of india, indian tribal culture, indian tribal tour., indian tribes, Khasi tribes, khasi tribes of india, popular tribes of india, tribes of india. hey I am from the Khasi tribe and some of the stuff written here about us is not true. Kindly verify your facts before you post your write-ups on the net. people get a wrong picture about us. The uniqueness of Khasis is in their language. In most place the same tribe would have only one language or speak the same. FIRST GET YOUR FACTS RIGHT THEN PEN DOWN YOUR WRITE-UP... Quite a number of the Khasi-Jaintia people follow Christianity but the ones who do not, follow the Khasi Religion - Ñiam Tynrai / Ñiam Tre... And, priority is not given to females just because the ancestral property is handed down to the youngest daughter. hey nikita me too needed the info for ssc project! but some peopleare saying that its wrong info! this is an awesome site for the knowledge of kids. I being a student praises this site and thanks it for providing the information which other sites couldn't. it is a wonderful site because there is every thing which I was needed for my project. This info really helped me as the info is given in short without leaving any details.Thanks!I also needed this info for my sst project.